Pasteurella multocida is a small, gram-negative, nonmotile, non–spore-forming coccobacillus with bipolar staining features. The bacteria typically appear as single bacilli on Gram stain; however, pairs and short chains can also be seen. P multocida often exists as a commensal in the upper respiratory tracts of many livestock, poultry, and domestic pet species, especially cats and dogs. In fact, Pasteurella species are some of the most prevalent commensal bacteria present in domestic and wild animals worldwide. P multocida infection in humans is often associated with an animal bite, scratch, or lick, but infection without epidemiologic evidence of animal contact may occur. See the image below. Wound infections associated with animal bites usually have a polymicrobial etiology, mandating the empiric use of broad-spectrum antimicrobials targeted at both aerobic and anaerobic gram-negative bacteria. Nevertheless, Pasteurella species are commonly isolated pathogens in most animal bites, especially in dog- and cat-related injuries. These injuries can be aggressive, with skin manifestations typically appearing within 24 hours following a bite. These wounds can exhibit a rapidly progressive soft-tissue inflammation that may resemble group A β-hemolytic Streptococcus pyogenes infections. Deeper soft tissue can also be affected, manifesting as tenosynovitis, septic arthritis, and osteomyelitis. More-severe disseminating infections may also develop, including endocarditis or meningitis, the latter mimicking Haemophilus influenzae or Neisseria meningitides infections in young children. Fortunately, Pasteurella species are fairly sensitive organisms and can be treated with a penicillin-based regimen. Respiratory: P multocida may cause upper respiratory tract infections, including sinusitis, otitis media, mastoiditis, epiglottitis,  pharyngitis, and Ludwig angina. In rare cases, P multocida may also cause lower respiratory tract infections, including pneumonia, tracheobronchitis, lung abscess,  and empyema,  usually in individuals with underlying pulmonary disease. Ocular: P multocida periocular abscess,  conjunctivitis, corneal ulcers, and endophthalmitis have been reported. Genitourinary tract: P multocida pyelonephritis, renal abscess, epididymitis, and cervicitis have been reported in rare cases. According to the American Pet Products Association, approximately 180 million dogs and cats live in the United States, cats currently outnumbering dogs by 12 million. Animal bites account for 1% (300,000) of annual emergency department visits. The estimated cost in health care expenditures has been reported to be $30 million per year. Approximately 10% of animal bites require medical attention; 1-2% eventually require hospitalization. Approximately 5 million animal bites are reported annually. The vast majority of animal bites involve dogs (85-90%), followed by cats (5-10%). Infectious complications occur in approximately 15-20% of dog-related bites and more than 50% of cat-related ones. Dog bites are associated with younger animals engaging in playful activities, mostly with children. German shepherd, pit bull, Staffordshire terrier, and mixed breeds are most commonly involved with human bites, while the golden retriever and Labrador retriever are least. Cat bites are usually provoked, typically by female felines, and occurring on the upper extremities or face. Sharp and long teeth of cats can easily penetrate human skin and create a deep puncture wound and even inoculate the periosteum component of bones. Indeed, cat-related wounds more commonly progress to more serious and deeper-tissue infections, including osteomyelitis and meningitis. P multocida infections occur worldwide. Cats are involved in 60-80% of human P multocida infections. Moreover, P multocida is isolated in 50% of dog bites. It is estimated that 10-20 human deaths per year occur following an animal bite. Infectious complications occur in approximately 15-20% of dog-related bites and more than 50% of cat-related ones. Following a bite, a rapidly progressive cellulitis may develop; deeper structures, including tendons, joints, and bones, can become affected, especially in cat-related injuries. Dissemination can occur. Chronic obstructive pulmonary disease is a risk factor for P multocida respiratory tract infection,  which carries a mortality rate of approximately 30%. Diabetes mellitus  and liver dysfunction  are predisposing conditions associated with pasteurellosis and associated bacteremia. Localized P multocida infections carry an excellent prognosis. Significant morbidity has been associated with musculoskeletal P multocida infections, especially those involving the hand. Disseminated P multocida infections carry a 25-30% overall mortality risk. All age groups can be affected by P multocida infections. Young children seem to be frequently involved in nonfatal dog bites. P multocida meningitis typically occurs in persons at the extremes of age. Heydemann J, Heydemann JS, Antony S. Acute infection of a total knee arthroplasty caused by Pasteurella multocida: a case report and a comprehensive review of the literature in the last 10 years. Int J Infect Dis. 2010 Sep. 14 Suppl 3:e242-5. [Medline]. Oehler RL, Velez AP, Mizrachi M, Lamarche J, Gompf S. Bite-related and septic syndromes caused by cats and dogs. Lancet Infect Dis. 2009 Jul. 9(7):439-47. [Medline]. Harris PJ, Osswald MB. Pasteurella multocida epiglottitis: A review and report of a new case with associated chronic lymphocytic leukemia. Ear Nose Throat J. 2010 Dec. 89(12):E4. [Medline]. Dryden MS, Dalgliesh D. Pasteurella multocida from a dog causing Ludwig's angina. Lancet. 1996 Jan 13. 347(8994):123. [Medline]. Goussard P, Gie RP, Steyn F, Rossouw GJ, Kling S. Pasteurella multocida lung and liver abscess in an immune-competent child. Pediatr Pulmonol. 2006 Mar. 41(3):275-8. [Medline]. Kagihara JM, Brahmbhatt NM, Paladino J. A fatal pasteurella empyema. Lancet. 2014 Aug 2. 384(9941):468. [Medline]. Mikaberidz N, Li EY, Taub CC. Pasteurella multocida infective endocarditis in an immunocompetent patient complicated by rhabdomyolysis and permanent hearing loss. J Cardiovasc Dis Res. 2013 Mar. 4(1):55-7. [Medline]. [Full Text]. Nettles RE, Sexton DJ. Pasteurella multocida prosthetic valve endocarditis: case report and review. Clin Infect Dis. 1997 Oct. 25(4):920-1. [Medline]. Koelemay MJ. Pasteurella multocida infection, a rare cause of mycotic abdominal aortic aneurysm. J Vasc Surg. 2009 Dec. 50(6):1496-8. [Medline]. Schneider JR, White GW, Dejesus EF. Pasteurella multocida-infected expanded polytetrafluoroethylene hemodialysis access graft. Ann Vasc Surg. 2012 Nov. 26(8):1128.e15-7. [Medline]. Adler AC, Cestero C, Brown RB. 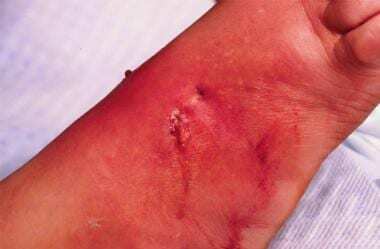 Septic shock from Pasturella multocida following a cat bite: case report and review of literature. Conn Med. 2011 Nov-Dec. 75(10):603-5. [Medline]. Fukuchi T, Morisawa Y. [A case of cat-scratch-induced Pasteurella multocida infection presenting with disseminated intravascular coagulation and acute renal failure]. Kansenshogaku Zasshi. 2009 Sep. 83(5):557-60. [Medline]. Green BT, Ramsey KM, Nolan PE. Pasteurella multocida meningitis: case report and review of the last 11 y. Scand J Infect Dis. 2002. 34(3):213-7. [Medline]. Per H, Kumandas S, Gümüs H, Oztürk MK, Coskun A. Meningitis and subgaleal, subdural, epidural empyema due to Pasteurella multocida. J Emerg Med. 2010 Jul. 39(1):35-8. [Medline]. Wade T, Booy R, Teare EL, et al. Pasteurella multocida meningitis in infancy - (a lick may be as bad as a bite). Eur J Pediatr. 1999 Nov. 158(11):875-8. [Medline]. Antony SJ, Oglesby KA. Peritonitis associated with Pasteurella multocida in peritoneal dialysis patients--case report and review of the literature. Clin Nephrol. 2007 Jul. 68(1):52-6. [Medline]. Hutcheson KA, Magbalon M. Periocular abscess and cellulitis from Pasteurella multocida in a healthy child. Am J Ophthalmol. 1999 Oct. 128(4):514-5. [Medline]. Blanco JF, Pescador D, Martín JM, Cano C, Sánchez MD. Acute infection of total knee arthroplasty due to a cat scratch in a patient with rheumatoid arthritis. J Clin Rheumatol. 2012 Sep. 18(6):314-5. [Medline]. Myers EM, Ward SL, Myers JP. Life-threatening respiratory pasteurellosis associated with palliative pet care. Clin Infect Dis. 2012 Mar. 54(6):e55-7. [Medline]. Tattevin P, Souala F, Gautier AL, et al. Diabetes in patients with pasteurellosis. Scand J Infect Dis. 2005. 37(10):731-3. [Medline]. Brivet F, Guibert M, Barthelemy P, et al. Pasteurella multocida sepsis after hemorrhagic shock in a cirrhotic patient: possible role of endoscopic procedures and gastrointestinal translocation. Clin Infect Dis. 1994 May. 18(5):842-3. [Medline]. Rollof J, Johansson PJ, Holst E. Severe Pasteurella multocida infections in pregnant women. Scand J Infect Dis. 1992. 24(4):453-6. [Medline]. Waldor M, Roberts D, Kazanjian P. In utero infection due to Pasteurella multocida in the first trimester of pregnancy: case report and review. Clin Infect Dis. 1992 Feb. 14(2):497-500. [Medline]. Waghorn DJ, Robson M. Occupational risk of Pasteurella multocida septicaemia and premature labour in a pregnant vet. BJOG. 2003 Aug. 110(8):780-1. [Medline]. Baud D, Bizzini A, Jaton K, Achtari C, Prod'hom G, Greub G. Pasteurella multocida Zoonotic Ascending Infection: An Unusual Cause of Tubo-Ovarian Abscess. Vector Borne Zoonotic Dis. 2011 Sep 16. [Medline]. American Academy of Pediatrics. Bite Wounds. Red Book 2012 - Report of the Committee on Infectious Diseases. 29th ed. Elk Grove Village, Ill: American Academy of Pediatrics; 2012. 203-6. Champlin FR, Shryock TR, Patterson CE, et al. Prevalence of a novel capsule-associated lipoprotein among pasteurellaceae pathogenic in animals. Curr Microbiol. 2002 Apr. 44(4):297-301. [Medline]. Chang K, Siu LK, Chen YH, et al. Fatal Pasteurella multocida septicemia and necrotizing fasciitis related with wound licked by a domestic dog. Scand J Infect Dis. 2007. 39(2):167-70. [Medline]. Citron DM, Warren YA, Fernandez HT, et al. Broth microdilution and disk diffusion tests for susceptibility testing of Pasteurella species isolated from human clinical specimens. J Clin Microbiol. 2005 May. 43(5):2485-8. [Medline]. Clark RB, Joyce SE. Activity of meropenem and other antimicrobial agents against uncommon gram-negative organisms. J Antimicrob Chemother. 1993 Aug. 32(2):233-7. [Medline]. Fajfar-Whetstone CJ, Coleman L, Biggs DR, Fox BC. Pasteurella multocida septicemia and subsequent Pasteurella dagmatis septicemia in a diabetic patient. J Clin Microbiol. 1995 Jan. 33(1):202-4. [Medline]. Goldstein EJ, Citron DM. Comparative activities of cefuroxime, amoxicillin-clavulanic acid, ciprofloxacin, enoxacin, and ofloxacin against aerobic and anaerobic bacteria isolated from bite wounds. Antimicrob Agents Chemother. 1988 Aug. 32(8):1143-8. [Medline]. Goldstein EJ, Citron DM, Merriam CV, et al. Activity of gatifloxacin compared to those of five other quinolones versus aerobic and anaerobic isolates from skin and soft tissue samples of human and animal bite wound infections. Antimicrob Agents Chemother. 1999 Jun. 43(6):1475-9. [Medline]. Goldstein EJ, Citron DM, Merriam CV, et al. Comparative in vitro activities of GAR-936 against aerobic and anaerobic animal and human bite wound pathogens. Antimicrob Agents Chemother. 2000 Oct. 44(10):2747-51. [Medline]. Goldstein EJ, Citron DM, Merriam CV, Warren YA, Tyrrell KL, Fernandez HT. Comparative in vitro activity of faropenem and 11 other antimicrobial agents against 405 aerobic and anaerobic pathogens isolated from skin and soft tissue infections from animal and human bites. J Antimicrob Chemother. 2002 Sep. 50(3):411-20. [Medline]. Goldstein EJ, Citron DM, Richwald GA. Lack of in vitro efficacy of oral forms of certain cephalosporins, erythromycin, and oxacillin against Pasteurella multocida. Antimicrob Agents Chemother. 1988 Feb. 32(2):213-5. [Medline]. Griego RD, Rosen T, Orengo IF, et al. Dog, cat, and human bites: a review. J Am Acad Dermatol. 1995 Dec. 33(6):1019-29. [Medline]. Hey P, Gow P, Torresi J, Testro A. Cirrhosis, cellulitis and cats: a 'purrfect' combination for life-threatening spontaneous bacterial peritonitis from Pasteurella multocida. BMJ Case Rep. 2012 Nov 11. 2012:[Medline]. Kimura R, Hayashi Y, Takeuchi T, et al. Pasteurella multocida septicemia caused by close contact with a domestic cat: case report and literature review. J Infect Chemother. 2004 Aug. 10(4):250-2. [Medline]. Kravetz JD, Federman DG. Cat-associated zoonoses. Arch Intern Med. 2002 Sep 23. 162(17):1945-52. [Medline]. Lion C, Conroy MC, Carpentier AM, et al. Antimicrobial susceptibilities of Pasteurella strains isolated from humans. Int J Antimicrob Agents. 2006 Apr. 27(4):290-3. [Medline]. Mandell GL, Bennett JE, Dolin R, eds. Mandell, Douglas, and Bennett's Principles and Practice of Infectious Diseases. 5th ed. Philadelphia, Pa: Churchill Livingstone; 2000. 2404-7. Meha H, Mackle I. Prosthetic joint infection with Pasteurella multocida following cat scratch: a report of 2 cases. J Arthroplasty. Jun 2004. 19(4):525-7. Murphy E. Microbiology of animal bites. Clinical Microbiology Newsletter. Apr 2008. 30(7):47-50. Raval P, Khan W, Haddad B, Mahapatra AN. Bite injuries to the hand - review of the literature. Open Orthop J. 2014. 8:204-8. [Medline]. [Full Text]. Rosenau A, Labigne A, Escande F, et al. Plasmid-mediated ROB-1 beta-lactamase in Pasteurella multocida from a human specimen. Antimicrob Agents Chemother. 1991 Nov. 35(11):2419-22. [Medline]. Weber DJ, Wolfson JS, Swartz MN, et al. Pasteurella multocida infections. Report of 34 cases and review of the literature. Medicine (Baltimore). 1984 May. 63(3):133-54. [Medline].